ABC Business Network monthly breakfast networking meeting for businesses in Armagh, Banbridge, Craigavon and surrounding areas. Breakfast will be served on arrival at 07:30am. This will be followed by a short presentation by one of our members, Roy Dougan, and a presentation by our guest speaker, Martin Gilchrist. 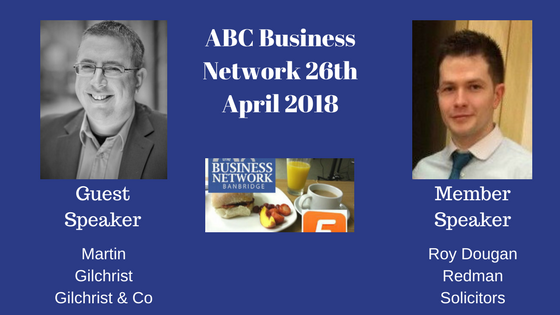 Martin will be talking to members and guests of ABC Business Network about the importance of building a brand and the impact of this on the success of your business. Martin will share some of the tactics he and Michelle have used to promote their business and the success they have had over the years. Following the presentations, all those attending will have the opportunity to briefly introduce themselves and their business, and participate in facilitated group networking. The meeting will close at 9am, however the room will be available until 10am if anyone should wish to stay on and spend more time in one-to-one or group meetings.